Join OSU Extension Greene County and Greene County Public Health for the Greene County Local Food Council Meeting on Tuesday, June 19, 2018 at 5 pm. The meeting will be held at OSU Extension Greene County, 100 Fairground Road, Xenia, Ohio 45385. See the flyer. 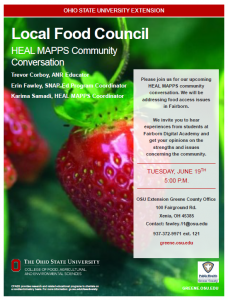 During the monthly Food Council meeting we will learn about upcoming HEAL MAPPS community conversations. Additionally, we will be addressing food access issues in Fairborn and more. We invite you to hear experiences from students at Fairborn Digital Academy and get your opinions on the strengths and issues concerning the community. If you have any questions about the Greene County Local Foods Council or upcoming events. Please contact Trevor Corboy or Erin Fawley at OSU Extension Greene County at 937-372-9971. Do you know a local food producer or grower? Help the Greene County Local Food Council by contributing to the Greene County Local Food & Producer Grower Database. Any information you can provide on a local food producer or produce grower in your area would be greatly appreciated. Please respond by June 18, 2018. If you have any questions, please contact OSU Extension Greene County, Agriculture and Natural Resources Educator, Trevor Corboy at 937-372-9971 or corboy.3@osu.edu. Thank you! Interested in local foods or where your food comes from? The Greene County Local Food Council invites you to their next meeting on Tuesday, April 17th (from 5:00 – 6:30 p.m.) at the OSU Extension Greene County Office (100 Fairground Road, Xenia, Ohio 45385). As always, all are welcome even if you have never attended. Questions may be directed to Trevor at corboy.3@osu.edu. The Ohio State University Direct Marketing Team will be hosting the Appalachian Table: Where Local Food Producers and Buyers Meet event on Friday, April 13th at the OSU South Centers located in Piketon. If you are a local producer or buyer, you will want to be a part of this event. This event will connect our local producers with our local buyers and bring business opportunities for both ends. Below is the flyer with full details. Registration ends on Monday, April 9th. Space is limited for producers, register today! Do you know of a food pantry or meal site in Greene County? Help the Greene County Local Foods Council create a Food Pantry and Meal Site database. Any information you can provide on a food pantry or meal site in your area would be greatly appreciated. A survey to add information is available here. Please respond by February 15, 2018. If you have any questions, please contact OSU Extension Greene County, Agriculture and Natural Resources Educator, Trevor Corboy at 937-372-9971 or corboy.3@osu.edu.